Ukeru is a crisis management technique rooted in the belief that the use of physical restraints is unnecessary and unproductive. We believe that all intervention — educational and behavioral — should be built on an approach of comfort rather than control. Ukeru is the Japanese word for “receive.” This word encapsulates our entire philosophy; at its heart, Ukeru is about treating those that depend on you in a way that you would want to be treated. The way we provide care should be the same as the way we would want to receive care. What makes Ukeru different from other crisis management techniques? Using a trauma-informed approach to create a supportive, caregiving environment sensitive to clients’ past experiences of violence and victimization. Helping individuals thrive in the least restrictive environment consistent with achieving the best outcome. Achieving the greatest impact with the least amount of disruption to an individual’s routine. A decade ago, our parent organization, Grafton Integrated Health Network (Grafton) issued a mandate to eliminate restraints without compromising employee or client safety. 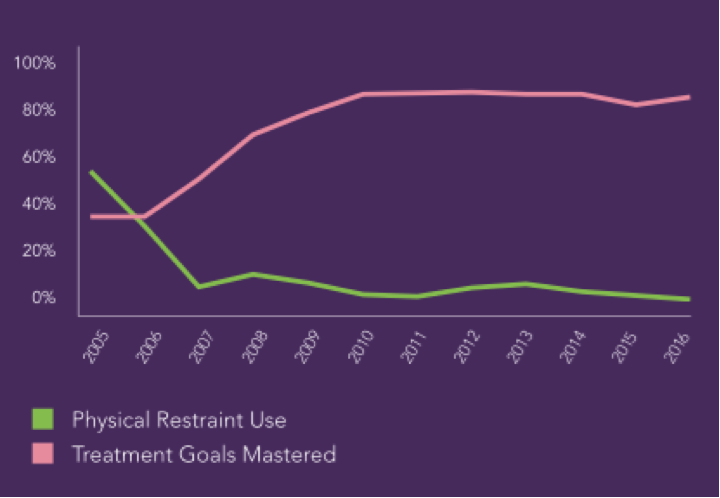 Since then, the organization has reduced the use of restraints by more than 99 percent, dramatically reduced the number of injuries to clients and staff and has significantly increased the rate of treatment goals mastered across the organization. In 2015, based on its experience and success, Grafton launched Ukeru Systems, a safe, comforting and restraint-free crisis management program developed by and for behavioral health professionals and paraprofessionals, educators and parents. Today, the Ukeru team travels the country, training others on these techniques. Won’t minimizing restraint and seclusion compromise the safety of clients and staff? No. Research shows that minimizing restraint and seclusion can enhance quality of treatment and increase satisfaction for those both receiving and providing services. By way of illustration, since launching Ukeru Grafton has decreased client-induced staff injuries, workers compensation premiums, lost time, modified duty days and turnover. Do I have to go through Ukeru training to order the blocking equipment? The Ukeru blocking pads are designed to be used in a certain way. To help ensure proper use, we do not sell the equipment to any organization who hasn’t adopted the Ukeru System. Where do we place the pads at our facility? To make them as natural as possible, pads should be placed throughout the environment. We strongly discourage storing the pads out of sight because we don’t want the clients to see them as a punishment or invasive tool. How do you introduce the pad to a client? It is important to have introductory meetings with your clients in order to orientate them to the blocking equipment: how the pads look and feel and how their use will help prevent restraints and keep everyone safe. Teams should demonstrate how the pads are properly used along with showing and telling staff what is not allowed. This orientation can be delivered individually, or in a small group settings. The method of delivery should be tailored to that which works best with the clients involved. The use of pictures and stories can also be helpful with individuals who have greater challenges. What sort of documentation do you attach to an incident in which blocking is used instead of restraint? Your organization will decide how to document Ukeru use according to your licensing requirements and/or company policy. Have you had clients try to strike you with the pads, or each other? We have not had clients behave aggressively towards each other with the pads. There have been a few times when younger clients have picked up the pads and playfully used them. But those instances were short as the novelty seems to wear off quickly. At times, clients do grab the pad away from staff, then throw it back at them. But the pads are soft and easy to avoid and/or catch in return. We do teach employees to immediately release the pad if a client attempts to pull it away as we want to do everything possible to avoid power struggles. Do you think that the pads are a visual trigger for escalation? With a proper introduction of the pads to the clients, proper use of the pads by staff, and normalized placement of the pads in the environment, the equipment shouldn’t be a trigger for a client. However, if a client has come from a forensic setting, you may choose to use one type of pad over another in order to be trauma sensitive should the person have had experience with cell extractions (in which riot shields are typically used). How many staff do you need to safely block? Blocking can be utilized with one employee who may be working alone. It is recommended that no more than three staff be involved in a blocking incident with one client. What happens when a client gets a weapon? We teach to keep a safe distance and try to get others out of the area when a client picks up an object to use as a weapon. Only when a client aggresses toward the staff would the pad be used to keep the staff safe while evading. How do we approach clients attacking one another? Two staff can use Safe-Turn on each client to separate them. Or, while one staff uses Safe-Turn for one client, another staff can use a blocking pad to prevent the other client from moving closer to his or her peer. Why isn’t Safe-Turn considered a restraint? Safe-Turn is a method of physical redirection that does not immobilize any part of the body. The person is allowed full range of motion, but it does help prevent a client from heading towards an unsafe area or situation. What are restraints and seclusions? Restraints and seclusions are coercive, high-risk techniques used to contain a child or adult considered a danger to themselves or others. Seclusion involves complete isolation, either for a short or extended amount of time. These practices are employed in a multitude of settings including behavioral health care facilities, public schools and detention centers, among milieus. Why is minimizing restraint and seclusion important? If restraint and seclusion don’t work, why are they still used? A trauma informed approach creates a supportive, caregiving environment sensitive to clients’ past experiences of violence and victimization. With a high likelihood of past trauma impacting one or more of the individuals involved in any given scenario, ensuring adequate support for these experiences is critical. A trauma-informed approach is critical tool to ensure a supportive environment that minimizes traumatic stress. Why is a trauma informed approach important? Trauma is pervasive and far-reaching. For individuals who have experienced traumatic events, the impact of re-experiencing that trauma through the use of restraints and seclusions can be devastating. Trauma is experienced through violence and victimization which includes not only sexual abuse, physical abuse, severe neglect, loss, domestic violence and/or the witnessing of violence, but also bullying, shame, fear and anxiety, among others. Trauma changes the brain; these changes cause reactions — fight, flight or freeze — that are based on the body’s response to a perceived threat. It can affect both the individual directly experiencing an event as well as those who bear witnesses to it. What are the impacts of trauma on an individual? Negative affects to mood, cognitive behavior and physical health can occur when a person re-experiences a past trauma.